Is a whippet a right breed for me ? You read in a dog magazine about them or you might have noticed a whippet in the streets and you fell in love at first sight with that sweet and delicate looking little sighthound. 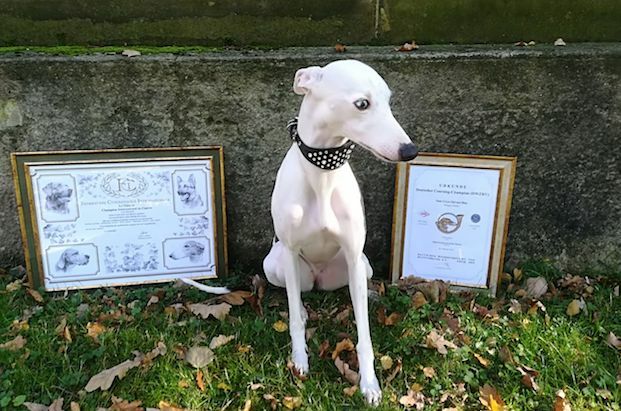 You will start to read about the breed and find out that whippets are quiet in the house, not barking very much and that they are great companions. And now you would like to know if this is true ! How many walks does a whippet need, how about its hunting instincts, how are whippets with kids, can they live together with cats and do they have to go on racing tracks ? Forget the description of the breed that you read ! In any case for the next 15 months ! Whippet puppies and youngsters are curious, very much lively and they tend to be bored very fast. That means for its owner that he should not leave his whippet puppy without supervision for more than a very short time and if it is unavoidable, only in a room which is as safe as possible. Take care that chargers, mobile phones, remotes, writing utensils and similar stuff is out of your whippet’s reach. Your puppy is technically interested and will try to find out the details about your small technical stuff, which means that they are no longer of use for you when your whippet finished its job. Never leave your puppy without supervision and because it is not always possible, check if you have a room where your puppy can stay with its bed and some toys without a risk for your goods and for the puppy itself. If you don’t have a safe room where you can leave your puppy, the best would be to use a crate. Of course only for a short time (up to one hour). Yes, I know that for some loving owners it is not nice to put a puppy in a crate but sometimes you might have to go to a doctor or in the supermarket and all family members are also busy. In that case it would not help if you come home and find your home in a mess and your puppy was lucky that the chewed cable which was not an active one. For short times of your absence use a crate and get your puppy used to it from the beginning. Offer the crate as a comfortable sleeping place, cover it and give your puppy some treaties and some chewing stuff. You will notice that it will like this comfy cave. Train your puppy that the crate will be closed from time to time and you will notice that your puppy will accept it without problems. This will be of further use when you want to travel with your whippet or you want to show it. Even in an airplane or a train and in a car the crate will always be a safe and comfortable place. With about 15 months your whippet will be a grown-up and it looks like a surprise, but then it will fit to the known breed descriptions ! It will play with your kids and loves to cuddle with them and listen to their secret stories. The whippet will accept your cats and your other pets and is always ready to follow you and to learn some tricks. Some whippets are trained to go along with you riding your horse or work as therapy dogs. Your whippet will sleep in its basket or on the sofa but as soon as you get in your mind that you want to go out for a walk, your whippet will be already waiting for you at the door. What about the need for running ? A whippet needs less action than a German Shepherd or a Border Collie. A whippet is not constantly demanding your attention or continues whole day to bring you a ball to throw. But for sure you have a little sportsman at home. Besides the walks with a possibility to sniff around and do its business, once a day your whippet needs an opportunity to explode. Ideal would be a fenced area where your whippet can run safely. A whippet is running about 400 m in about 30 seconds, this shows you that a small park in the city might be too dangerous for your fast runner. Look for a fenced area, other doggy friends might tell you about these places, maybe your local animal shelter or dog clubs offer playgrounds, maybe you can find a riding stable where your dog can run safely or, which would be the best, join the local Sighthound Racing Club in your area. 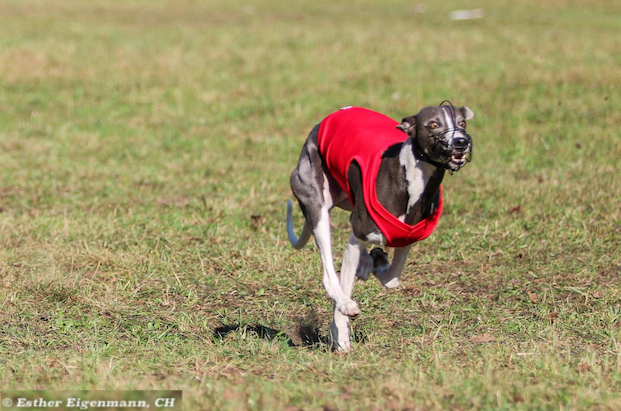 Even if you are not ambitious to race your dog, you might have fun to join other whippet friends and have a great opportunity to let your whippet run and play with others in a fenced area of the club. If this sounds all too much effort, then you should choose another breed ! Yes, they are. For many centuries Sighthounds were bred for hunting and even the young breed whippet was originally bred for hunting and catching rabbits. Nowadays hunting of animals with dogs is strictly forbidden in whole Europe and Sighthounds but they can find a replacement in lure coursing. 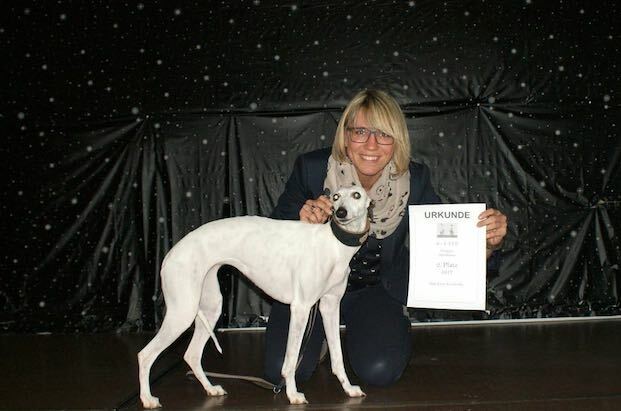 For already quite a while many Sighthound breeds split up in show and racing lines but even if your puppy is coming of a pure showline keep in mind that it might start to hunt when an animal is jumping in front of it. Not even the breeder can foresee in a litter if a puppy is a hunter or a more relaxed companion. Best solution is if you train your puppy just from the beginning to come to you and pick up a treatie or a toy when you call it, so you might be able to call it also before it starts to chase. Even better if you notice a deer or a rabbit before the dog and put the leash on your little hunter. What to do when your whippet runs off chasing an animal ? Don’t panic, in normal cases your whippet comes back to the place where it started the race. Normal case means that there are no roads or railroads where you let your dog run free ! Does my whippet have to go to a race track ? No, not really. But it needs a daily opportunity to get rid of its power, to run free for a while. If it would make fun to you and if you have a sighthound club with a race track nearby, give it a try, the club members will support you. There is barely no happier whippet face when it comes back from a race, either a competition or just for fun ! You can enjoy all adventures with your whippet, everything what makes fun to both of you. But don’t drill your whippet ! 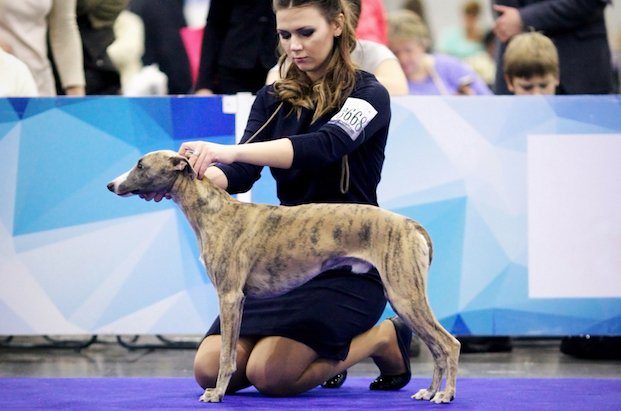 If for you a dog is only desirable when it is exactly doing what you ask or if you want to win agility competitions, then please don’t buy a whippet ! There are many whippets which are doing obedience and agility but some just don’t like it or are so hyperexcited that they don’t work precisely. As an owner of a whippet you must accept this and just have fun. Feel free to contact us when you need further information about our beloved breed !